Motor vehicle crashes are the leading killer of kids in the United States. 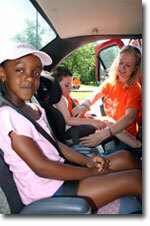 Many injuries and deaths can be prevented by properly using car seats. With four out of five seats misused, certified technicians provide a valuable service to parents and caregivers concerned with safe transport for their most precious cargo. Since the national certification program began in 1997, tens of thousands of individuals have been certified as Child Passenger Safety (CPS) Technicians and Instructors. CPS technicians and instructors put their knowledge to work through a variety of activities, including car seat checks where parents and caregivers receive education and hands-on assistance with the proper use of child restraint systems and safety belts. If you are interested in becoming a certified CPS technician please call Lisa at 217-531-4319.